6 weeks in India – How much does it cost? We spent 6 weeks in India during 2014, during which it very quickly became my favourite country in the world, not only because it is ridiculously cheap! It really was the perfect backpacker destination, money here goes far and you can get by on very little a day if needed, or live and eat like kings and queens for not much either! We are budget travellers, but one thing we don’t mind spending a bit more money on is food. We ate mainly in good restaurants, usually twice a day, so maybe this put our daily budget quite up a bit. On our first day in India we were in Fort Kochin, we had no idea where to start with where to eat, so we found ourselves on Trip Adviser and we decided to try one of the most recommended in the area – Masala Fort. We ordered a drink each, a chicken curry each, a naan each AND a rice each. Home in England this would have easily cost at least £40, we couldn’t believe it when we saw the bill totalling just 550 rupees (£5.50 at the time). So yes, we certainly ate like kings in India. I worked out that overall, we spent around £5-6 a day each on food and drink. This really is a comfortable budget for food and soft drinks. But note that we only purchased alcohol twice in India – alcohol we found to be expensive, plus we were having too much fun to need it anyway! Food aside. Everything else we kept cheap. Accommodation prices vary a lot in India and is dependant on where you are. Apart from on 2 occasions, we always stayed in budget guest houses or hostels, usually costing less than £5 a night. The cheapest hotel we stayed in was £1.50 (The Milkman Guesthouse – Pushkar) – the most expensive by far was £28 (Hotel Bentley – Marine Drive, Mumbai). We tried an AC2 ‘second class’ train once (4 beds, air conditioning, a curtain for privacy, bedding provided, actual windows instead of bars) the rest of the time we travelled on ‘sleeper-class’ trains (6 beds, no AC, no curtain and no glass window) rather than paying for the higher class tickets. I was worried about what sleeper class would be like at first, but it was completely fine, very exciting, and provides a fantastic experience of mixing with the every day locals. We avoided taxi’s (we got one once and got scammed! ), we got local buses whenever possible and if not we got tuk-tuks, always fixing the price first. We avoided tours, and we only got 1 internal flight. By doing all the above, apart from getting scammed of course, our cost of travel around the country was kept extremely cheap. For example, a train which took over 30 hours cost us only £7. To make up for the fact we were scammed £20 on a taxi, we also spent one day working on the set of a Bollywood movie in Mumbai, where in a 13 hour shift we made a total of £5 each. So how much does it cost to travel in India? 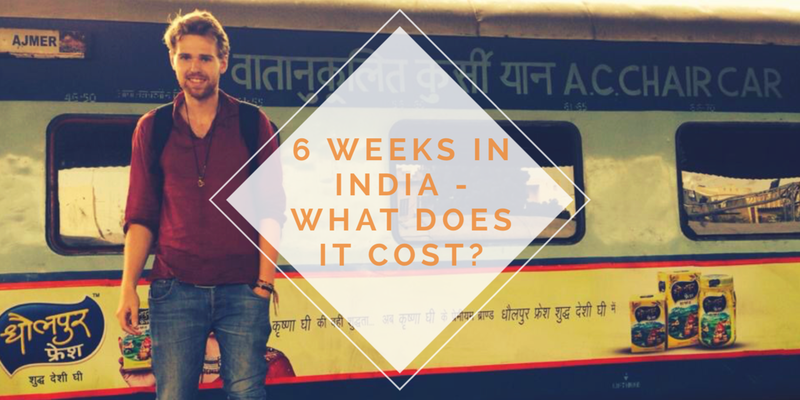 I personally spent just under £600 for 6 weeks in India – I spent an average of £13.90 per day. Even with the daily splurges on food, India is still the cheapest country I have travelled to. Please note: This figure is not including my visa, travel insurance, flights in/out of the country or my vaccinations. All prices are of February and March 2014. Absolutely I agree with you that India can be experienced on a low budget too. Hi. How did you get a opportunity to play in Bollywood movie? Nice overview! Hi Ave! Some guys at our hostel were randomly asked on the streets if they would take part in the Bollywood movie, and they gave us the number to call to take part too! 🙂 was such a cool experience!